Recent data on the U.S. economy have been mixed. But yesterday’s weak labor market report (discussed more here, here, and here) provides a reminder that thinking of the economy as being in anything other than a technical recovery at this time is likely an exaggeration. The report showed the unemployment rate inching higher to 9.8 percent—and it would have been even higher absent a measured decline in labor market participation. Those active in the labor market declined by an estimated 571,000 in August. Discouragement about job prospects is a likely explanation for at least part of this decline. *Following the 1970 recession, the unemployment rate was 6.1 in December 1970 and again in August 1971. 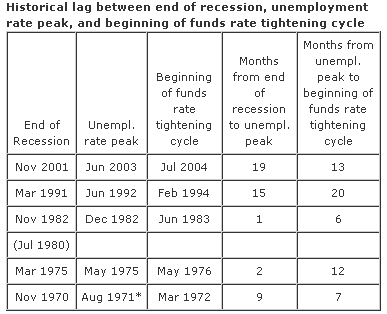 If the December 1970 peak is used, months from end of recession to unemployment peak is 1 and months from unemployment peak to beginning of funds rate tightening cycle is 15. Source: Bureau of Labor Statistics, National Bureau of Economic Research, and Federal Reserve Board. From the table, it is clear that there is considerable variation in how long it takes for the unemployment rate to move lower after the economy enters recovery mode. The typical explanation for the lag is that, as the economy shows signs of improvement, more people enter the labor force. These additional people raise the denominator in the unemployment rate calculation that often more than offset actual declines in unemployment (more on the labor force from Calculated Risk). The past two recessions stand out as cases where the months from the end of the recession before the unemployment rate peak were very long—more than a year. Of related interest is the historical relationship between the peak in unemployment and the beginning of a policy tightening. (Tim Duy discusses prospects for Fed policy and contrasts some recent economic data with recent Fed commentary.) Of course, the Fed does not base policy solely on movements in the unemployment rate, and the always useful advice to not casually extrapolate future decisions based on the past is even more important given the unusual circumstances of this recession. Nonetheless, historically, the beginning of a tightening cycle has lagged behind the peak in the unemployment rate by many months. This pattern is true for expansions when the FOMC was felt to have done a poor job in managing inflation, such as the post-1975 period, and it is equally true for periods when the Fed is believed to have done a very good job of managing inflation, such as the post-1991 episode. Let me be clear that I am not offering a forecast but instead a reminder that the dynamics of unemployment do not always follow the dynamics of recessions. And for what it’s worth, Federal Reserve policy has not historically responded immediately to declines in the unemployment rate—for both better and worse.